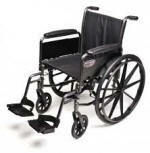 Freedom Transport Chair is one of the lightest transport chairs available today (17 pounds with leg rests). The chair comes in either attractive Red (Burgundy), Blue or Silver colored frame and has a weight capacity of 300 pounds. The seat is 19" wide with a 16" depth and upholstered with breathable nylon. The back seat comes with 2 quick release buttons that allows the transport to fold-down and to fit nicely into small areas. Comes with desk length arms that allow users to easily pull up to a table at home or a restaurant. The chair also comes standard with a cup holder attached to the front arm, seat belt for safety, and multiple pocketed back that can be used to store personal belongings.